From a policy perspective, this means that Belgian immigration rules (1) must address the objective need for streamlined access for non-Belgian employees and self-employed persons, (2) without disrupting the country's labour market and public finances, at both the national and local levels. Experience indicates that Belgium has been successful in developing and applying an evolving set of – consistent and stable – rules for dealing with corporate immigration, even if certain processes may appear quite intricate and be perceived less positively. In that regard, and in the context of the recently transferred legislative powers over economic migration in the regions, authorities and stakeholders are aware of the importance of continually improving the applicable rules and processes. Belgium is a federal state composed of three regions (Flanders, Wallonia and Brussels) and three communities (Dutch, French and German-speaking) in which (corporate) immigration legislation is currently enacted at federal and regional levels. In light of constitutional changes introduced by the Special Act of 6 January 2014 on the Sixth State Reform (effective 1 July 2014), all powers pertaining to economic migration have been transferred from the federal government to the regional governments, meaning the legal framework is progressively adapted by regional pieces of legislation. For the sake of clarity, the transposition of the Single Permit and ICT Directives3 requires the alignment of federal and regional legislation, which has already resulted in delays in the transposition. In this context, the currently applicable regional pieces of legislation do not materially depart, at this stage, from the legislation in force prior to July 2014. The most relevant pieces of legislation are the Foreigners Act of 15 December 1980 (and its implementing Royal Decree of 8 October 1981), providing the general immigration framework, and the Foreign Workers Act of 30 April 1999, as modified by the applicable regional lawmakers (and related implementing decrees) on corporate immigration aspects. Other relevant legislation includes the Foreign Self-Employed Persons Act of 19 February 1965, as modified by the applicable lawmakers (and related implementing decrees), governing the immigration status of foreign directors and self-employed persons in Belgium, and the LIMOSA provisions contained in the Omnibus Act of 27 December 2006 and its implementing decrees, dealing with the mandatory notification requirements when carrying out (self-)employment activities in Belgium. It is also important to bear in mind that the Belgian courts and authorities are often confronted with legal arguments based on EU or international norms, with which they are therefore quite familiar. In corporate immigration matters, the above-mentioned legislation is applied under the authority of regional bodies (see below), which may result in differences in approach, justified by local labour market considerations. the importance (and verification) of proper compliance with other rules applicable to the proposed situation, such as mandatory employment, social security and tax rules. These specific features arguably provide a certain degree of flexibility for applicants in the short term, while rewarding those considering longer-term professional activities in Belgium. This approach is generally perceived as attractive to applicants and corporate immigration stakeholders, without placing an undue burden on Belgium's labour market and public finances. the authorities in charge of economic aspects (the economic authorities; i.e., at the regional level, also accessible abroad via the Belgian consulates). For corporate immigration matters, both the immigration and economic authorities must be involved, which may create some confusion for first-time applicants. The authorities are cognisant of the intricacy of certain application processes and, with a view to streamlining these processes, do their best to communicate clearly on their respective websites.7 Experience also shows that the authorities are efficient in their processing of standard corporate immigration cases and have a history of structurally improving these processes, which demonstrates their willingness to meet the legitimate expectations of corporate immigration stakeholders and reinforces Belgium's attractiveness as a convenient business hub at the heart of the European Union. Different levels of authorities are entrusted with monitoring compliance, from government agencies8 to the local police. In that context, the federal and regional authorities, as well as any other stakeholders, benefit from the assistance and expertise of the autonomous public agency Myria (formerly known as the Federal Centre for Migration) in monitoring and analysing the immigration policies in place. a full waiver of the work permit requirement, allowing (temporary) employment without prior authorisation (work permit waiver). 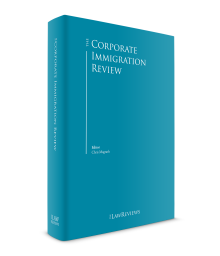 In corporate immigration matters, the regular application process with a labour-market test is gradually becoming the exception rather than the rule. Indeed, the Belgian authorities are aware of the importance, in the eyes of corporate immigration stakeholders,9 of predictability regarding the outcome and duration of processing (which is difficult to ensure when a labour market test is applied). As an EEA Member State, Belgium does not require EEA or Swiss nationals to hold a work permit to work in Belgium. In addition, third-country nationals19 (including non-EEA and non-Swiss nationals) who are long-term residents of another EU Member State benefit from a fast-track work permit process when applying for positions affected by labour shortages. Belgium also applies favourable rules to the nationals of OECD member states20 attending training in Belgium (see Section I.iii). Although progressively less relevant in a corporate immigration context, bilateral treaties on international employment entered into with Algeria, Bosnia and Herzegovina, Kosovo, Macedonia, Montenegro, Morocco, Serbia, Tunisia and Turkey still play a role when fast-track processing is not applicable. Bilateral social security agreements contribute to the attractiveness of Belgium as a regional hub in the EU. Indeed, Belgium has a good network of such treaties, allowing treaty-partner nationals employed in Belgium not to lose benefits in their home country while qualifying for freedom to provide services in the EU under certain circumstances. The Sixth State Reform provides that, as from 1 July 2014, the regions are competent for corporate immigration rules, except those pertaining to residence status, which remains governed by federal law.21 Although the legal and practical implications of this reform are currently22 a work in progress, pending the ongoing transposition of the Single Permit and ICT Directives, no radical departure from current corporate immigration policy is expected in the short term. Indeed, under the previous system (applicable until 30 June 2014), the regional authorities were involved in the implementation of policy for employees and were already tailoring certain aspects to meet regional requirements. The fact that these authorities have new powers (e.g., over self-employed persons) and more discretion in their decision-making process (e.g., regarding employees and self-employed persons) has not dramatically or immediately changed their approach in these matters, which is therefore expected, at least in the near future, to remain consistent with past practice and decisions. Moreover, important aspects of the statutory immigration framework and policies remain in the hands of the federal government or require cooperation between the different levels. Finally, owing to the increasing role of the European Union in corporate immigration matters, the regional authorities will have to take into consideration the legislation and case law of EU administrative, legislative and judicial bodies. That being said, owing to greater regional flexibility, the new setup may allow for some interesting developments in the mid to long term. For the same reasons, these developments are expected to provide even more efficient legislative and policy tools to increase the attractiveness of the Belgian regions from a corporate immigration perspective. In a context of transfer of legislative powers over corporate immigration matters to the regions, relatively few legislative changes occurred in 2016 pertaining to these matters. The most relevant developments from a corporate immigration perspective are the following. The Act of 18 December 2016 introduced new provisions aiming at fostering 'integration' of foreign nationals authorised to reside for a limited duration or entitled to an unlimited residence right, such as non-EEA nationals professionally active in Belgium as employees or self-employed persons, as well as their accompanying dependants. These provisions are applicable as from 26 January 2017, but will arguably require some clarifications owing to the apparently broad level of discretion given to the authorities. In a nutshell, the residents at hand will have to demonstrate their 'integration', before the expiry of their residence permit (i.e., generally issued for a maximum of one year). This demonstration may be done in different ways (i.e., there are some non-limitative guidelines in that regard) by the residents at hand, such as referring to their duly authorised professional activities in Belgium (i.e., this would arguably be the preferred way for holders of a work permit or professional card), showing proficiency in the official language of their place of residence in Belgium, showing material participation in social activities in Belgium (it being understood that this notion is not defined and could arguably be construed quite broadly with a view to including activities such as participation in neighbourhood or school activities or in other philanthropic activities, membership in sport or social or hobby clubs), or receiving officially recognised training or education in Belgium. In the absence of this demonstration, the Immigration Office could terminate the residence by not renewing the residence permit or cancelling it. That said, although not specifically defined – and possibly allowing for a non-negligible level of discretion by the Immigration Office – the 'integration standards' are arguably of a best effort nature, to be assessed in light of the specifics of the individual situations (including the typical temporary nature of the stay in Belgium in a corporate immigration context). The same Act of 18 December 2016 also provides for an 'initial statement' by the same group of foreign nationals, whereby they would confirm their proper understanding of and compliance with 'the fundamental norms and values' of their place of residence in Belgium. The specifics of the initial statement must be implemented further, however. Finally, these new provisions, enacted at federal level and having a material impact on the residence permit, should not be confused with similar provisions existing at regional level, but from which most individuals residing in Belgium in a corporate immigration context are exempted. Although Belgium is keen on remaining attractive to the typical corporate immigration stakeholders, the recent overhauling of some of its general immigration rules may have some impact on professionally active individuals and their accompanying dependants. In that regard, the stakeholders must be aware of the extension of the maximum processing time of family reunification registrations (i.e., nine months, theoretically extendable by two additional periods of three months), requiring timely assistance with a view to mitigating practical relocation misunderstandings or annoyances. For the sake of completeness, Belgium is late in transposing the Single Permit and ICT Directives, which should have been done by 25 December 2013 and 29 November 2016, respectively. Referring to these delays, a ruling from the Civil Court of Liège ordered on 3 February 2017 the Immigration Office to renew the residence card of a non-EEA national pending an application for the renewal of his work permit. Although isolated at this stage, the ruling is worth mentioning to illustrate the familiarity of the Belgian judiciary with legal arguments based on EU or international norms. Activities such as receiving or providing training in Belgium, attending (preparatory or other) meetings in Belgium, collecting information and data in Belgium with a view to briefing or training an offshore team, etc., also qualify as working in Belgium. In this context, from a practical perspective, the first question that typically arises is to what extent the foreign national can be considered a visitor on a business trip in Belgium (i.e., not deemed to work in Belgium within the meaning of the applicable rules or, in the affirmative, benefiting from a temporary work permit waiver). In this regard, caution must be exercised owing to the restrictive interpretation of the notion of business trip, bearing in mind that the mere issuance of a type C Schengen visa (commonly referred to as a business visa) by the Belgian or other EU Member State authorities is not sufficient. Indeed, such a visa only allows its holder to travel to the port of entry of the country in question and request entry; it does not allow entry, residence or the conduct of business per se. For these reasons, experience indicates that visitors to Belgium, after having obtained a business visa, are sometimes under the erroneous impression23 that their visit will, under any circumstances, always qualify as a business trip. In light of the foregoing, best practices require that the employer assess whether it qualifies for a temporary work permit waiver. If not, the employer must further assess whether it could benefit from fast-track processing. In most corporate immigration matters, the employer will indeed benefit from such processing, aimed at easing the application requirements and facilitating the process, which will only last a few weeks. If fast-track processing is not available, which is exceptional in typical corporate immigration matters, the question will arise as to whether employment in Belgium is a realistic option. Experience indicates that, when duly advised, the employer will realise that under these circumstances employing the individual in Belgium is not realistic within a reasonable time frame, if at all possible. if applicable, a copy of the services agreement in the framework of which the employee is posted to Belgium. In the event of a negative decision, the employer can appeal within a 30-day period. As the processing of the appeal may take several months, it is recommended to assess the accuracy and adequacy of the application prior to filing. Once the work permit has been obtained, the employee can apply for a visa with the consulate (if residing abroad) or adjust his or her immigration status with the municipality (if residing in Belgium). In addition to these provisions, mandatory Belgian rules of public policy37 shall apply when the posted employee performs activities for a sufficiently long period in Belgium. The courts have discretion to define this concept (generally from six to 12 months). However, a risk exists even for a short posting to Belgium (i.e., six months or less). Moreover, when a minimum gross remuneration level is required by applicable Belgian law, allowances paid to reimburse expenses incurred during an assignment, such as travel and accommodation, are not considered remuneration. upon renewal of the work permit, by verifying if the documents submitted at the time of the application have been implemented correctly and in accordance with their terms and conditions. The Belgian authorities also rely on information collected via the mandatory online registration system (the LIMOSA system), since 1 April 2007; the registration process is explained – in English – on the official website, www.limosa.be. In the absence of prior registration, which must be proven by means of an attestation, the employer is required by law to notify the presence of the visiting employees to the authorities. Finally, it is important to bear in mind that undocumented or unlawful employment of a foreign national is considered a serious offence under Belgian law, with hefty sanctions for the employer and, potentially, any other party involved (such as the members of the employer's and its client's management).38 Legal risks also exist for the employee. In other words, both the employer and the employee have a common interest in avoiding non-compliance. In this context, monitoring is a reality and compliance with the applicable rules and regulations in the fields of employment, social security and tax law must be and remain a priority on the employer's checklist. Acting otherwise will automatically result in a refusal to grant the work permit, either at the time of the initial application or upon renewal, it being understood that the employer will also be exposed to financial and criminal sanctions. An employee benefiting from a work permit waiver or for whom a work permit has been obtained must take the necessary steps to obtain or adjust his or her residence permit. In practice, this means that an employee who does not hold a Belgian residence permit must obtain a type D visa from the Belgian consulate with jurisdiction over his or her place of residence abroad. Employees who already hold a Belgian residence permit or who benefit from a visa waiver, and are thus allowed to enter and stay for a material portion of the permissible 90-day per six-month period in the Schengen Area,39 may apply at the municipality of their place of residence in Belgium (direct registration). The documents to be submitted are the same under the two routes and typically include the original work permit, police certificates from the country or countries of residence during the past 12 months and a medical certificate. Additional documents, such as internationally legalised and translated birth, marriage or divorce certificates, are required for the visa application on behalf of accompanying dependants. While the visa application on behalf of the employee is generally processed within two weeks, recent experience shows that the application on behalf of accompanying dependants may take longer.40 Direct registration always takes longer: processing times in excess of three months (for the employee) and six months (for the accompanying dependants) are not uncommon. Since March 2015, certain categories of foreign nationals must pay a fee to cover administrative expenses when filing certain types of applications to enter or stay in Belgium.41 More specifically, this pertains to foreign nationals applying for a stay of more than three months in Belgium (it being understood that certain exceptions apply to EU nationals and applicants for international protection, such as refugees, beneficiaries of subsidiary protection, unaccompanied foreign minors and victims of trafficking). The fee is due when applying for a type D visa. Foreigners benefiting from a visa exemption (such as US nationals) can register directly in Belgium. In that case, the fee will be due when registering with the local municipality. The fee is in addition to existing consular or municipal fees; an exemption from consular or municipal fees does not apply to this processing fee. Hence, if the visa application or registration is ultimately rejected, the fee will not be reimbursed. Once the type D visa has been obtained, the employee and accompanying dependants must register with the municipality of their place of residence in Belgium, with a view to obtaining their Belgian residence permit, valid for the duration of the work permit plus one month. This final step will take four to 12 weeks (or longer in exceptional cases), depending on the place of residence. The residence permit replaces the visa, which is generally valid for three to six months. After renewal of the type B work permit, the employee must renew the related residence permit. After five years, the employee may apply for a Belgian residence permit of unlimited duration, allowing his or her employer to benefit from a work permit waiver. For the sake of completeness, in the (unlikely) event of deportation proceedings, Belgium's highest administrative court, the Council of State, extended to Belgian deportation proceedings the 'right to be heard' (i.e., due process), recently recognised by the Court of Justice of the European Union in its ruling of 11 December 2014 pertaining to the application of Directive 2008/115/EC on common standards and procedures in Member States for returning illegally staying third-country nationals.42 This means that an individual subject to deportation proceedings must have the opportunity, before a decision is rendered, to express his or her point of view on the legality of his or her stay. To this end, a formal communication channel must be organised by the immigration authorities (as opposed to an informal communication channel with the municipal authorities or police). This shows that EU rulings can be quite rapidly taken into account by the Belgian immigration system. Belgium does not have a favoured immigration status for investors. The authorities are nevertheless aware of the importance of attracting investors, it being understood that, at present, investors are expected to carry out professional activities in Belgium, either directly (e.g., as self-employed consultants or service providers) or by playing an active role in a corporate vehicle (e.g., as a director of a Belgian company). In other words, a mere financial investment is currently not sufficient. Although no modifications to this approach are expected in the very short term, there is nonetheless a growing awareness that changes to this policy could help the regions attract foreign investors. Changes can therefore realistically be expected in the near future, particularly considering the new regional powers in this area. A professional card must always be obtained prior to the start of professional activities. This requirement aims to balance the interests of foreign nationals who wish to work as self-employed professionals in Belgium against the regions' socio-economic interests. As is the case with foreign employees, certain (temporary) waivers of the professional card requirement are available to self-employed individuals. The most relevant is the temporary waiver for 'business trips'. Business trips are visits to Belgium by a self-employed foreign national, who does not have his or her place of residence in Belgium. Business trips will typically involve visiting professional partners, negotiating and entering into contracts, attending trade fairs and exhibitions, or attending board or shareholder meetings, provided the trips do not last longer than three consecutive months. If the scope or duration of the visits exceeds this period, a professional card will be required. Other waivers are available related to the residence status of the individual and are similar to those available for employees. The application for a professional card is typically filed with the Belgian consulate having jurisdiction over the place of residence of the self-employed individual. In exceptional cases, when the applicant is already entitled to reside in Belgium, the application may be filed in Belgium through a business desk. The required documents will depend on the type of activity envisaged. In any case, a certificate of managerial skills must be obtained on the basis of existing degrees or experience or after having attended specific classes and passed an exam. Other documents include a comprehensive business plan, fully budgeted and realistically financed, as well as a copy of the letter of intent and (draft) contracts concluded with, or comfort letters from, local partners. There is no specific investment amount required, it being understood that the proposed business venture must be viable in the coming years, which requires objectively sufficient financial means in the form of available cash or credit lines from reputable banks. Finally, the application package will include the supporting documentation for the type D visa, which is applied for simultaneously (unless the applicant already holds a residence card). The processing time is approximately four to 12 weeks, possibly longer if additional documents are requested or questions raised (which is not uncommon since the authorities verify whether access requirements for the intended professional activities are met and all other obligations fulfilled). That being said, the authorities are efficient in their processing of applications with added value for the local economy. In the event of a positive decision, a two-year card is generally issued, usually renewable for a longer period (up to five years) upon filing a detailed renewal application with supporting documents evidencing, among other things, proper compliance with social security and tax laws. In the event of a negative decision, an appeal may be lodged within 30 days of receipt of the decision. The appeal may take several months. If the negative decision is confirmed, no new application is possible within two years of the initial application, unless the application pertains to other activities or includes new facts, or if the initial application was formally rejected without reviewing the facts. The Belgian statutory corporate immigration framework is currently undergoing important structural modifications (see Section III). Therefore, certain difficulties may arise in the short term, particularly considering the fact that implementing legislation will have to be passed and that certain internal processes will be adjusted. This has already resulted in delays in the transposition of the Single Permit Directive and the ICT Directive, since implementation will require the alignment of federal and regional legislation. That being said, no radical departure is expected from the current framework, which already offers above-average possibilities compared with other EU Member States. In other words, the current developments are expected to allow for better tailoring of immigration policy, which should benefit all stakeholders. 1 Henry Hachez is a partner at VWEW Advocaten VOF. The author would like to thank Liesbet Van Dael, a counsel with the firm, for her research and assistance preparing this chapter. The information in this chapter was accurate as of May 2017. 3 Directive 2011/98/EU of the European Parliament and of the Council of 13 December 2011 on a single application procedure for a single permit for third-country nationals to reside and work in the territory of a Member State and on a common set of rights for third-country workers legally residing in a Member State and Directive 2014/66/EU of the European Parliament and of the Council of 15 May 2014 on the conditions of entry and residence of third-country nationals in the framework of an intra-corporate transfer. 4 See for Schengen Area member states, http://ec.europa.eu/dgs/home-affairs/what-we-do/policies/borders-and-visas/schengen/index_en.htm. 5 See for the EEA Member States, www.europarl.europa.eu/atyourservice/en/displayFtu.html?ftuId=FTU_6.5.3.html. 6 As in other Schengen Area Member States, short stays by foreign nationals are governed by the Schengen Borders Code and Visa Code while long stays are subject to the Belgian long-term visa (D visa); the foreigner must register with the local municipality of his or her place of residence in Belgium within three or eight days, respectively. Exceptions to this requirement apply to short stays in a hotel. The rules applicable to EEA and Swiss nationals are less stringent owing to their right of free movement within the EEA, it being understood that Belgium interprets this right strictly and will not hesitate to ask EEA and Swiss nationals to leave Belgium if they lack sufficient financial means to support themselves and cover their health insurance. 7 For the immigration authorities, see https://dofi.ibz.be/sites/dvzoe/index.html; for the economic authorities, see www.belgium.be/en/work/coming_to_work_in_belgium/. finspection services at the regional and community levels (Flemish Region, Brussels-Capital Region and Walloon Region) that mainly have jurisdiction over work permits, temp agencies and private job placement agencies. 9 Such as members of the business community that employ a sizeable number of non-EEA nationals to maintain and develop their activities in Belgium. 10 Individuals earning an annual remuneration of at least €40,124 gross (2017) and holding a college-level degree. 11 Individuals earning an annual remuneration of at least €66,942 gross (2017), entrusted with a management position and having relevant professional credentials. 12 Specialised technicians posted to Belgium for a maximum duration of six months by a foreign employer and coming to Belgium to install, launch or repair equipment made or delivered by their employer. 13 Contrary to the general perception, most internships in Belgium are subject to employment and immigration law requirements. 14 Employees posted by a foreign employer and coming to Belgium for a maximum duration of six months to be specifically trained in the framework of a sales contract entered into between the Belgian firm and their employer. 15 The 'spousal employment programme'; such programmes are typically considered an important incentive in a global context of dual careers. 16 As opposed to individuals benefiting from permanent resident status in other EU Member States, who qualify only for a waiver of certain requirements. 17 This exemption is valid for 60 calendar days per calendar year with a maximum of 20 consecutive calendar days per qualifying meeting. 18 These executive employees must earn at least €66,942 gross (2017) and be employed under a local Belgian employment contract by a Belgian company. 19 Non-EU nationals, in practice including non-EEA and non-Swiss nationals. 20 See www.oecd.org/about/membersandpartners/ for information on the OECD Member States. 21 Special Act of 6 January 2014 pertaining to the Sixth State Form. 22 This contribution was written in May 2017. 23 Such an impression is often reinforced by the official mentions printed on the visa that pertain to the reasons for entry, the number of permitted entries and the period of validity. 24 The authorities are under no obligation to confirm the exemption in a specific case: the waiver derives automatically from the law and it is the employer's responsibility to decide (with or without the assistance of its adviser) to rely on a specific waiver. 25 For example, the regional headquarters in Belgium must inform the regional authorities prior to employing the executive employees qualifying for the work permit waiver. 26 For type A and C work permits, jurisdiction derives from the employee's place of residence. For type B work permits and the EU Blue Card, jurisdiction derives from the employee's intended place of employment in Belgium. 27 The employee must have worked for four years during an immediately preceding uninterrupted stay of at least 10 years in Belgium, on the basis of a type B work permit. The four-year period may be reduced to three years (i.e., if a treaty applies) or two years (i.e., legal residence in Belgium of the employee's accompanying dependants). 28 The qualifying grounds are based on the residence status of the employee in Belgium and include certain limited categories of accompanying dependants or students, as well as asylum seekers waiting for a decision on their application (i.e., pending a decision on his or her case, an asylum seeker does not benefit from any work permit waiver, it being understood that the authorities reduced to four months the length of the initial period – after the filing of an asylum application – in which a type C work permit could be obtained). 29 This type of work authorisation is rather recent (effective since 10 September 2012) and slightly different from the three others, since it requires a joint application by the employer (which must apply for a temporary work permit in Belgium with the regional authorities of the place of employment) and the employee (who must apply, at the same time, for the actual Blue Card with the consular or municipal authorities). 30 Applications for type A work permits are becoming less relevant, owing to the full waivers generally available to the target group of applicants. Applications for type C work permits are typically seen in specific industries such as health care or hospitality. The Blue Card is currently not the preferred option for highly skilled employees. One reason appears to be that the salary threshold is higher (€51,882 gross, in 2017) than for a type B work permit for a highly skilled worker (€40,124 gross, in 2017), with no obvious benefits for the parties in the short term (i.e., the next two years). That being said, owing to its recent introduction (10 September 2012), it is still too early to assess a real trend. 31 Other documents may be required, as well as a sworn translation into Dutch, French or German, when the documents are not in an official language of Belgium. Documents in English are generally accepted without translation, it being understood that such a translation may always be requested. 33 The labour market test requires the employer to demonstrate that it is not possible to find, on the EEA labour market, an employee able to satisfactorily perform the activities in question, even after training. 34 Most categories of employees encountered in the corporate immigration context are exempt from these requirements. Exceptions exist, such as for the EU Blue Card, which can be denied for labour market considerations, both in the home country or in Belgium. 35 The Act of 5 March 2002 implementing Directive 96/71/EC of the European Parliament and of the Council of 16 December 1996 concerning the posting of workers in the framework of the provision of services and establishing a simplified scheme for maintaining the social documents for undertakings that post workers to Belgium, as modified by the Omnibus Act of 11 December 2016 pertaining to the posting of workers (notably transposing the Directive 2014/67/EU of the European Parliament and of the Council of 15 May 2014 on the enforcement of Directive 96/71/EC concerning the posting of workers in the framework of the provision of services and amending Regulation (EU) No. 1024/2012 on administrative cooperation through the Internal Market Information System (the IMI Regulation). iall enforceable collective bargaining agreements (minimum wage scales are usually laid down in collective bargaining agreements). 37 An exhaustive list of these laws and statutory provisions is difficult to make. In the absence of an express initiative by the legislature, the case law is important in this regard. A rule that has not been considered a matter of public policy in the past could nevertheless be recharacterised as such in the event of future litigation. Such characterisation is generally attributed to statutory provisions that protect workers, such as termination entitlements and non-compete clause requirements. 38 The sanctions include a prison term of six months to three years or a fine of €3,600 to €36,000 per employee (capped at €3.6 million), possibly combined with a ban on doing business in Belgium for one month to three years (including a possible order to close the business for the same period). When criminal prosecution is waived (at the discretion of the prosecuting authorities), the administrative fine (ranging from €1,800 to €18,000 per employee, capped at €1.8 million) remains high, considering that it can also be combined with a temporary ban on doing business and closure of the business in Belgium. 39 Experience indicates that this option is not recommended for employees requested to travel extensively in the weeks or months after their arrival in Belgium. Indeed, local processing may take several months and entail travel restrictions within or outside the Schengen Area. Caution must therefore be exercised when considering this option. 40 In corporate immigration matters, the authorities process the visa applications on behalf of accompanying family members on a priority basis. That being said, the processing of such applications can take several months under the current circumstances. cchildren under 18 years of age: minor applicants are exempt from the fee. 42 C-249/13. See also ruling of the Council of State of 19 February 2015 (No. 230.257).